In 1982 in the small village of LaPatrie Quebec, a Canadian native by the name of Robert Godin united with a small group of friends to produce the first Seagull guitars. Their ultimate goal was to produce guitars having some of the same qualities as more expensive guitars, but at prices that were more accessible to the working musician. In particular, Seagull focuses on production of fine tops utilizing old growth wood and shimmering varnish finishes in order to produce the best sound and most beautiful acoustic guitars possible. 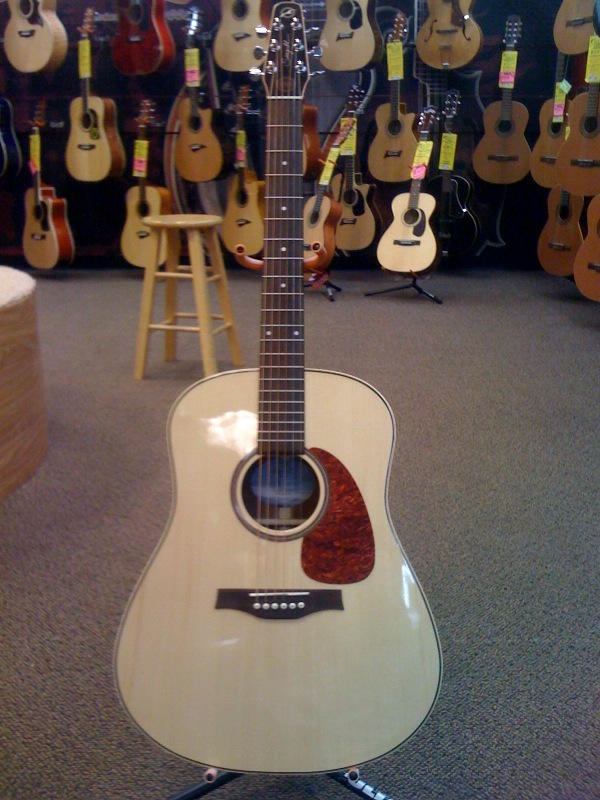 Seagull is just one of the subsidiary brands of guitar currently available from the Godin company. The Seagull SWS series (or Solid Wood Series) is composed of gorgeous Mahogany on the back and sides, a wood renown for both its beauty as well as its long-enduring strength. The fretboard and bridge are made of redwood and the top of the guitar is solid Spruce. The entire guitar is finished with a high gloss treatment (hence the "HG" in the name) which gives the guitar an exquisite look and feel to the touch. Seagull takes great care and pride in their high-quality applications and this dedication to finish quality can have profound and measurable effects on the overall sound quality of the instrument. In addition, the use of high-quality varnish tends to create soft, porous finishes the allow a clean exchange of moisture from the instrument into the air and vice-versa. This moisture transference allows the instrument to age properly and helps to avoid an unfortunate condition known as "Neck hump". When moisture is not allowed to pass freely it can collect underneath the area where the neck is attached to the body of the guitar and cause the neck to raise slightly, creating problems in the upper frets of the guitar. Taking great care with the finishing process, as well as utilizing old growth woods are two steps that Seagull has taken in the production of a long-lasting and quality instrument. The body of the Seagull SWSHG measures 20" by 15" and is approximately 5" deep. The neck measures 1.8" inches at the nut and the fretboard has 21 frets, 14 of which are accessible. 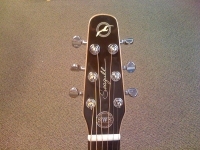 Of note here as well is the anomalous shape of the headstock. Rather than the more traditional rectangular shaped head seen on many acoustic guitars, Seagull has opted to create a streamlined look that gives the guitar a unique countenance as compared to other acoustic guitars. Other specs of note on the Seagull SWSHG are the use of Quantum 1 electronics which are available in the SWSHG model. 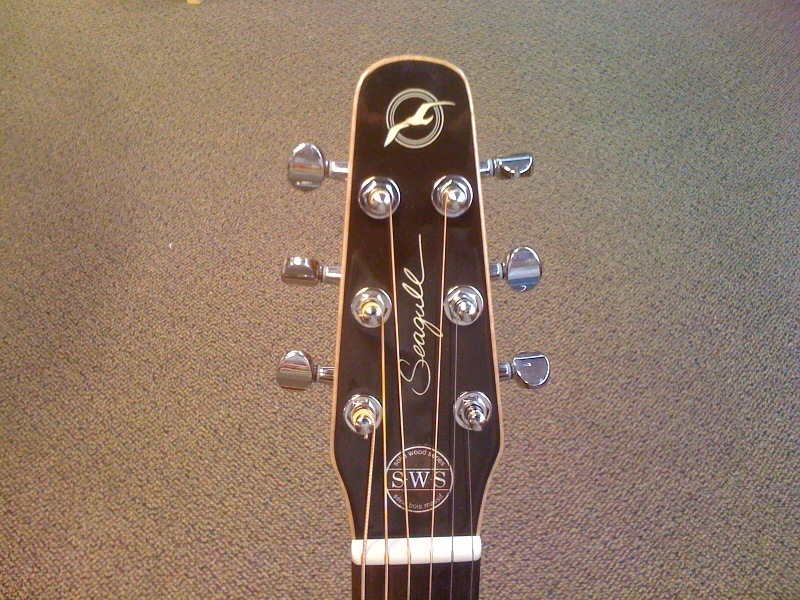 Seagull uses a Piezo pickup on this model which is simply an acoustic pick-up system located under the saddle. Small crystals located in the system pick-up small vibrations when the strings are struck and transfer them electronically into the pre-amplifier. This type of pick-up has only one weakness and that is that it tends to miss a lot of resonance but the only way to mitigate that particular problem is by using high-end condenser microphones which have problems of their own, especially when it comes to volume control. Hence, the Piezo system is really the most ideal pick-up for the money. The Seagull SWSHG is currently available for around $700 and can be purchased either on-line or in music stores carrying Godin products. In lieu of the high quality materials that the company insists upon using in their products, as well as the elevated standards that Godin is renown for, the price seems more than reasonable. As a mid-level guitar, the Seagull SWSHG is a great buy and seems to be well worth the expenditure. This model has a nice feel to it and rings with clear treble tones. It does not seem to possess much in the way of mid-range tones but whether you desire that facet or not is certainly a subjective issue. 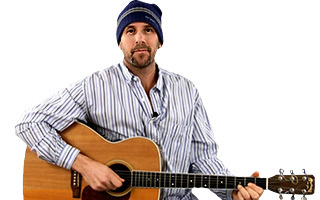 A guitar sound located in the treble region can be a perfect fit for someone who is also a singer/player and who may want a guitar that "pockets" their voice, or seeks to find a guitar that compliments their vocals range. In general though, the rosewood fingerboard has a smooth feel to it which is easy to execute changes upon and the overall feel of the guitar is comfortable.